These are GREAT! My bundle of joy loves nothing more than to chew anything into a million pieces and then bring me the little pieces as a present! While incredibly cute (look what I made for you daddy) he really cherishes EVERY single piece and will not quit until each piece has been thrown across the room a million times (somehow manages to find them no matter how small) The Kong lasts a very long time and he gets a little whiney when he can't get pieces off but great for Game Of Thrones or some other show that requires his silence. If only I was strong willed enough to not throw the bits for him!.... Those damn eyes!!! 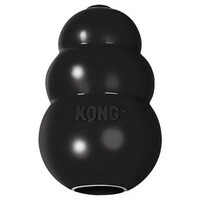 These kongs are great to stuff with food to keep your dogs occupied. My lab puppy managed to chew the red kongs up but these xtreme kongs are much stronger. He hasn't managed to chew these ones up and hasn't even left many teeth marks in them, so well worth the money! If I could only have one toy for my dog, it'd be this one. Tough, long lasting and versatile, it's the best dog toy in existence. This is the only toy our lurcher hasn't managed to destroy! She loves it to bits, both empty and with treats and enjoys chucking it around as she never knows which way it's going to bounce. We have Stafford's and they love these. Not indestructible and unlike the previous post they will make a definite impression immediately, usually the first tier disappearing on the first chew, but they do last a few months, though they are only given when we are there. Well worth the money for the pleasure the dogs get in my opinion. The best Kong of them all,made of really tough rubber which my 8 month old Labrador hasn't managed to make any teeth marks in plus it takes longer for them to de-stuff with it being less flexible. Add to that the fab price at Vet UK and this is just a great product!